Love the tempura batter on this beautiful Hoki fillets of fish. Kids love them and they are a lot cheaper than the local fish and chip shop. I’m not a huge fan of seafood, would prefer a flake from the fish and chip shop, but as these are much cheaper and healthier I like to buy them sometimes for my kids and I. I actually like these! The batter is very yummy. Great alternative to greasy takeaway. I love Sealord hoki with tempura batter, the fish is moist with the perfect crispiest batter that is a big hit for my family. Lovely with a fresh salad and some home made chips! Better ( and healthier) then takeaway! I’m allergic, but I buy these for my husband and children occasionally. They really seem to like them especially when they also get chips with them. Not badly priced either. Sealord Hoki Fillets in Tempura Batter are quite delicious frozen fish fillets. They have a nice coating that tastes good and a soft fish fillet inside the tempura batter. Tempura Batter is so delicious! Friday night fish n chips – solved!! I love frozen fish, lets be honest, most fish and chip shops have frozen stuff now, so I would prefer mine to come from a big trusted brand. This product does not disappoint – do turn it half way through the cook, so it is crunchy on both sides. 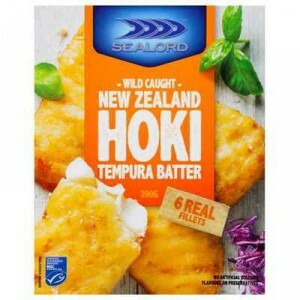 How would you rate Sealord Hoki Fillets Tempura Batter?